Founded in 1954, Visitation Catholic School opened its doors to grades 1-6 under the watchful eyes of Sister Mary Urban. 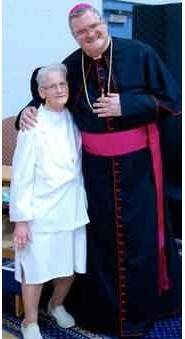 In 1974, Sister Thomas Leo Monahan took the reigns and guided thousands of children for almost 40 years, instilling in them a dedication to their faith, their peers, their families, their community, and themselves. Today, under the leadership of Mrs. Carrie Mijal the school has 270 families with over 400 students in preschool through eighth grade. "Visitation School is part of Visitation Parish and a place where we learn about the lessons taught by Jesus Christ. We do our best each day to pray, worship, and learn together. Our teachers help us understand the importance of respecting and serving others as Jesus did. I will work hard today and every day to follow the example of Jesus." - Recited by students at the beginning of each week. Visitation School, a ministry of Visitation Parish, believes that a solid Catholic education is fundamental in the expression of the mission entrusted by Jesus to the Church. The Catholic vocation calls all individuals to transform themselves and society through faith education, community worship, and service to others as directed in the National catechetical Directory. Through equal partnership with parents, the primary educators of our students, we offer all children a strong faith-centered foundation while developing their God-given potential. The first science fair was held in 1965. The first school specials were held in the 1970's. The original Visitation school building was just where the primary wing is now. The sisters slept in what is now the art room. The school office was in the back of the current kindergarten room.